Looking for Parts for an Isotherm Refrigerator or Isotemp Water heater? If so, you've come to the right place. There are many different Models and the parts do change from year to year so finding the exact part may take a little extra care. If you have Cruise refrigerator - front loading cabinet the model number is located on a label that is inside the cabinet - either on the door or on the interior. The Model number will have 2 or 3 digits near the start of the number that will tell us the model of the refrigerator. You can check the New Products section to see photos and descriptions of the different Models. A link to the parts list, manuals and diagram is also included with the description of the products. 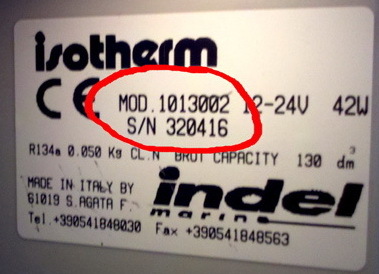 If you have a cooling unit - separate compressor and evaporator or holding plate the model number will be printed on a label on top of the compressor system.The model numbers for the cooling units are 4 digits (such as 4701 or 2507) there may be some extra digits on the MOD # but the model is included near the beginning of the part of number. A parts list and diagram is included in the new products section of the Isotherm-Parts website. If you would like help identifying the the system or a part sending photos is a good way for us to assist you.